An artist's concept of the Orbiting Carbon Observatory. SANFRANCISCO ? 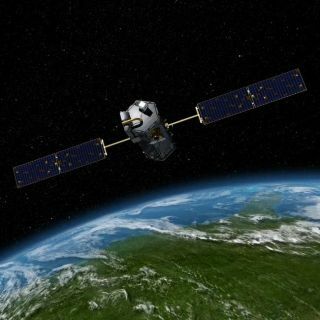 As NASA?s new Orbiting CarbonObservatory (OCO) moves closer to its planned launch next week, the teamresponsible for the spacecraft faces enormous challenges to fly the first-everprobe to map carbon dioxide levels across. ?OCO will be making one of the mostchallenging measurements of any atmospheric trace gas that has ever been made,?said Charles Miller, OCO deputy principle investigator at the Jet PropulsionLaboratory (JPL), in Pasadena Calif.
OCO ispoised to launch from California?s Vandenberg Air Force Base atop a Taurus XLrocket on Feb. 24 to begin its carbondioxide-hunting mission. The spacecraft will use three high-resolutionspectrometers built by Hamilton Sundstrand Sensor Systems of Pomona, Calif., tomeasure carbon dioxide and oxygen molecules in the Earth?s atmosphere based onthe way those molecules absorb sunlight. That datawill then be used to show the specific regions where natural and man-madesources are producing carbon dioxide as well as highlighting areas, calledsinks, where oceans and plants are removing carbon dioxide from the atmosphere.OCO will circle the Earth every 99 minutes, mapping the globe every 16 daysfrom its near-polar, sun-synchronous orbit. Throughvarious activities including forest fires and the burning of fossil fuels,sources on Earth emit approximately 8 billion tons of carbon every year. But onlyhalf of that carbon remains in the atmosphere. The other half is hidden - absorbedby Earth?s oceans, plants and soils, said Anna Michalak, OCO science teammember from the University of Michigan in Ann Arbor. ?Therelative fraction of carbon that is staying in the atmosphere versus going intoplants and oceans varies dramatically from year to year,? Michalak said. ?Wewant to understand why plants and oceans are taking up as much carbon as theyare ... so we can predict how they will behave in the future.? Once thespacecraft is in orbit, the OCO management team will spend up to 13 weeksconfirming that the spacecraft and its subsystems are functioning properly,said Ralph Oscillo, OCO deputy project manager at JPL. Once OCO is found to bein good working order, the spacecraft will be maneuvered into position as thelead spacecraft in the A-Train, a constellation of fiveEarth observing satellites flying in formation around the globe.After that, OCO scientists will spend months evaluating the initial data beingreturned by the onboard instrument to ensure the spectrometers are fullycalibrated. Oscillo said science operations would begin in October or Novemberwhen the OCO team plans to begin providing data showing the regionaldistribution of carbon dioxide. Theenormous challenges inherent in the mission are due to the small variations inthe amounts of atmospheric carbon dioxide. Those levels range from a maximum of362 carbon dioxide molecules in 1 million molecules of air, to a minimum of 351carbon dioxide molecules in 1 million air molecules - a 0.3 percent difference,said David Crisp, principle investigator for the OCO at JPL. Thevariation, while small, has big implications for scientists studyingclimate change. For OCO to do its job, it must accurately measure theminuscule changes in atmospheric carbon dioxide. To verify that OCO?s measurements of atmosphericcarbon dioxide concentrations are accurate, data gathered from the spacecraftwill be compared with measurements obtained by ground stations, tall towers andairborne instruments as part of the National Oceanic and AtmosphericAdministration?s carbon dioxide research program, Michalak said. OCOinstrument data also will be compared with observations made by Japan AerospaceExploration Agency?s Greenhouse Gases Observing Satellite - or GOSAT - whichwas renamed Ibuki followingits Jan. 23 launch. Ibuki is designed to measure carbon dioxide levelsaround the world. However, the two spacecraft carry very different instruments.Ibuki carries an interferometer designed to detect atmospheric methane andcarbon dioxide. OCO employs a gradient spectrometer designed specifically tomeasure carbon dioxide, Crisp said. ?Theobjectives of the two missions are different,? Crisp said. ?GOSAT [Ibuki] islooking for carbon dioxide sources for treaty monitoring purposes. Thosesources are a little easier to see than sinks, because sources are fairlyintense and localized. We are looking for sinks which are much weaker, moredistributed and harder to find.? The twosatellites will cross orbit paths several times a day. ?That gives us anopportunity to take nearly simultaneous measurements at a few points on theglobe every day so the teams can compare the results,? Crisp said. The NASAbudget includes $278 million for the entire OCO mission, which is scheduled tolast two years. If the primary mission is successful, NASA officials couldextend OCO?s science operations well beyond 2011. The spacecraft carries enoughfuel to remain in orbit for five to 10 years, Crisp said.